Colombia is the northernmost country in South America and claims only relatively small portion of Amazonia. However, much of the eastern part of the country is covered with dense tropical rainforest. 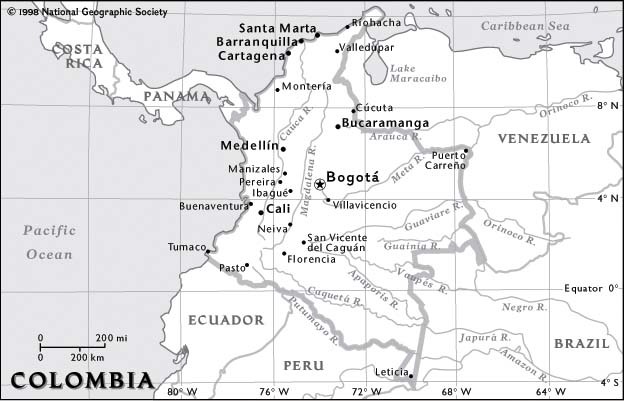 The Central Intelligence Agency (U.S. government) map of Colombia shows that most cities are in the western half of the country, west of the Andes mountains. Leticia in the the far southeast is Colombia's biggest Amazon city. This National Geographic map shows the main Amazon towns of Leticia, Pasto and Florencia. Although the northeast of the country is covered with rainforest it is drained by the Orinoco River watershed.